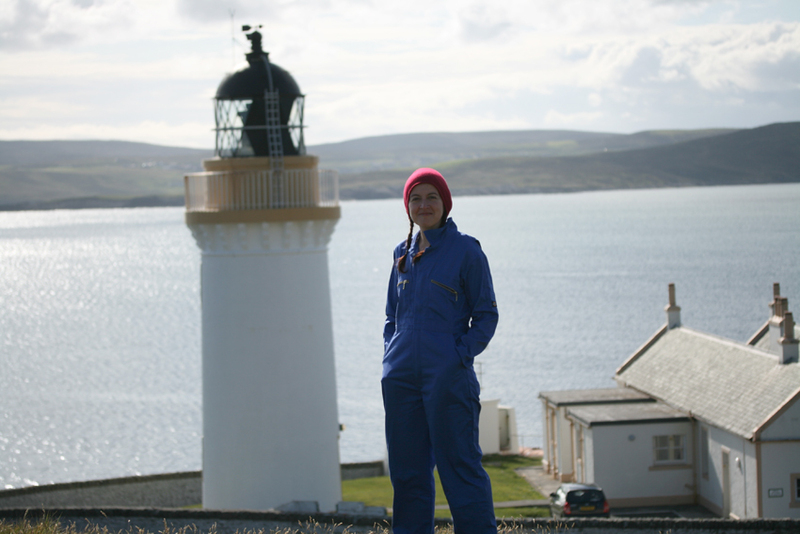 I purchased this boiler suit from LHD Marine supplies in Lerwick a while ago and have been wearing it pretty much constantly for the past three weeks. We have not had a washing machine; I have been spending most of my time decorating, and for both reasons it has formed a useful uniform. For some reason I feel very happy wearing it. Perhaps this is because the boiler suit makes me feel as if I am getting things done, and indeed, I actually AM. Last time I was in Shetland I had an interesting conversation with a friend of mine about these garments, which, given the amount of serious sea and land work that goes on there, are pretty ubiquitous. I was told that many Shetland men have boiler suits of ascending value, and keep one for “best”. I am seriously considering doing the same. My “thing” for boiler suits is of some long standing, as I recall that, for my twelfth birthday I asked my Mum to sew me one, which she kindly did. This stupendous 1980s garment was pale pink, and featured turn ups and giant batwing sleeves. I have no photographs of me wearing it, but given that I also had a terrible perm at the time, I fear that I must have looked like a small, pastel-clad circus entertainer. I proudly wore the pink boiler suit for the first party I was allowed to hold without the presence of my parents. My only recollection of this momentous event is that Christopher Hodgkinson played frisbee with some mini tacos, firing them into next door’s yard, where, after the effects of evening rain, they expanded to form a soggy snack-based crazy paving. There were words, but not of the serious kind. My affection for my boiler suit leads me to question my horrified reaction to the animal-print onesies that are the evening-wear of choice of many Edinburgh youths, as well as to the fleecy “leisure” suits that are sold for festering on the sofa. All these garments say to me is “fire hazard” and “adult baby”, neither of which are positive associations. Or perhaps I am merely late to the boiler-suit party as onesies of all kinds were certainly the thing a couple of seasons ago. I recall I saw an entirely functional-looking navy boiler suit on sale for £350 last year at YMC. All I can say is that you can get a boy’s age 9-10 32″ boiler suit from LHD Marine supplies for £15 and it will do you just fine. Do you have a boiler suit? Or do you, as I, arbitrarily divide different kinds of all-in-ones into categories of acceptability? I am interested to hear about your relationship to these garments. This digression comes to you from upstairs, where I have finished the woodwork and am about to start painting the walls. Below me, the kitchen is actually IN, with its (gulp) oak surfaces and exciting appliances (including a dishwasher, which I have never previously possessed – the novelty!). But the plaster is still wet, and the walls have yet to be painted and tiled. This will happen in a couple of weeks and then I promise there will be pictures. In any case, I hope to have my studio painted and completed over the next couple of days and be back at my desk by Friday, so if you’ve been waiting for an email response from me I’ll be beginning to catch up then. I have a boiler suit its gray fisher stripe Its a little big one me It still fits and is very comfortable and relaxing to wear and works very well for whenever I’m washing walls with the paint roller or working on the house I always wear black comfortable socks and either boat slip ons or black canvas sneakers I haven’t painted in some years I’m hoping to whenever someone I know needs help painting just wondering two things do you have to keep buying these suits everytime you paint or have a house project and what do you wear for footwear when you’re wearing the boiler suit black socks and comfortable canvas sneakers In the picture you look so comfortable and relaxed wearing the boiler suit merry christmas!and best wishes! in the new year! Better a boilersuit than a onesie! I love your boiler suit! I hadn’t given it a thought previously but it would be so handy for many of my activities. I searched in the US and found an innovative company called Rosies Workwear for Women. It is a woman owned company that makes coveralls/boiler suits specifically for women’s shapes, inspired by all the six million Rosies (the Riverter) from the 1940’s. I really like the more feminine style of Rosies boiler suits/coveralls and am going to have to get one. Your kitchen looks gorgeous! Can’t wait to see more photos. Well done! I’m a little late to this thread, but I just have to add that during my stint as a radical lesbian feminist in the early 80s (I was such a little sweetie! only 17! ), painters’ overalls were pretty much all we wore. The more daring among us wore the strappy dungaree-style ones with NOTHING UNDERNEATH. You could also buy white ones and dye them – I made myself a pale turquoise pair, and a lilac pair. They went well with feminist, anti-racist etc badges on the bib. I cannot praise highly enough my PADDED boiler suit by Dickies, bought years ago for about £45 from Arco in Linlithgow, Scotland. They didn’t have a ladies’ version so it’s a small gents. Just perfect for working outside in the garden in anything but the hottest of weathers in Scotland, or for painting inside with all the windows open. The padding isn’t too thick so I don’t look like the michelin man, unless I pile on underneath a simmet, long-sleeved t-shirt and thick jumper. I have been known to go out in public in it, feeling very business-like and capable. It’s pleasingly grubby with paint and mortar and one of the pockets is now ripped – surely a de rigeur touch? What entertaining reading – and popping up of memories! As an English girl in a predominantly American-international school, dungarees were one of the accepted “uniforms” in our school culture – I had some proper denim ones with tool loops (I was thrilled!) and we wore them loose with band t-shirts. I also had some blue/white stripey ones when I was about 13, with a zip at the front; when I spent my summers in the UK I got called Andy-Pandy, then I sewed the wide legs to skinny and wore them to a punk concert where I got thoroughly spat on, ugh!! The next ones were red and I wore those to death aged about 15, and the last pair I had were regular denim and I wore them at the beginning of my 1st pregnancy; I was horrified to find I still couldn’t do them up after the baby was born lol! Apart from some black velvet maternity dungarees in 1991 I haven’t worn anything like this since then. My eldest daughter borrowed those for a school sketch when she was 15 and they were envisioning themselves at 40 – she was pretending to expect her 4th child and was the heart and soul of all the village societies; funnily enough, she is heading in exactly that direction!! When she was small, I put her in dungarees often for playing out or riding, brilliant, and she soon learnt to cope with the straps. I did make myself a quite swish, loose, turquoise jumpsuit in the 80s, but I have never owned a proper working boiler suit or even heard of padded ones :O. Am I missing out and do I need one before I’m 50??!! You might enjoy knowing what this kind garment is called in French : “bleu de travail”. Congratulations on your decoration work. The only boiler type suit I’ve ever worn/owned was a padded one, when I was working in a barn (horses) in the USA. It was in the Appalachians, so CCCCOLD in winter, and the padded suit was fantastic – kept you clean, but also much warmer than a coat – no draughts getting in at the back. I’ve been pondering dungarees as a practical clothing option recently, for general housework, rather than decorating…might be a bit ’80s though! My dad (retired agricultural worker) has always had blue boiler suits for messy jobs. My boyfriend, who is in the Royal Navy, has ‘retired’ Navy boiler suits, which are part of their uniform. White for the officers, blue for sailors. White ones are, unsurprisingly, quickly stained but do the job of keeping clothes clean for decorating or working on the car. Firstly, let me hold my hand up and admit that I too had a horrific 80’s perm at the tender age of 12 (alas there is photographic evidence and even a pastel drawn portrait which adorned my grandparents wall for many years, showing my curls). I love the boiler suit, very 1940’s factory worker chic. I would love a yellow one. In my mind there is no condoning animal print onesies..even the craziness of youth does not excuse this particular horror. It’s just too much. Best of luck with the rest of your renovations..you look invigorated..it suits you! Union suit. My wool gray union suit makes winter sleeping so much the better. But I think I too might feel more productive (regardless of my actual productivity) if I wore such a boiler suit as yours. As it is I have closed-back clogs in levels like you describe, including ones that I consider my “good” shoes – much to my mother’s dismay when I sport them. I had a boiler suit in the ’80s which I wore very little because it was white and it made going to the loo such a chore. The house sounds wonderful. I am very much looking forward to pictures. I had two boiler suits, for when I had farm animal/equine tutorials whilst at veterinary college. Although dead useful, the absolute faff that was required every time I needed to use the loo made them one of my least favorite things to wear. Really quite annoying when you’re on-call all night, it’s 3am, and you have 5 minutes to visit the toilets before you need to get back to work! Oh, and the ability to bend over to tie my shoes was also lost! I have one that I used to use for sampling soil and groundwater at contaminated sites. I had to wear a special flame-retardant one for working on crude oil contaminated sites in Alberta. I like the term boilersuit, but I know it as a coverall. Thankfully, I don’t work on contaminated sites anymore and I think my coverall is buried somewhere in the bottom of a closet along with my hard hat, respirator, hi-vis vest and steel-toed boots. My sister’s family are farmers in Cumbria and they all wear boilersuits. In my father’s day it was blue drill bib and brace overalls worn in summer with a light jacket called a keitel. I see hefty teenage girls on the street wearing animal print onesies and it reveals more than anything how a trend will be followed no matter how unflattering ie they would rather look terrible in something high-fashion than wear something which suited their figure but was not on trend. I have a deep blue dungaree style boiler suit for painting – it was my partners, but he treated himself to a new one, so it is several sizes too big, so I have to role up the legs. As a teenager, I had a red boiler suit – it was not colour fast, so my poor mother had to wash it separately. The first time she washed it, the following was contained my brother’s underwear which came out pink! From then on she had to do a wash with no clothes to ensure that the dye was no longer in the machine. I have no boiler suit … but a fair amount of “painting” clothes. :) Maybe I should get the adult onsie. Btw, love the article about you in Vogue Knitting’s fall edition. Well done. (un)fortunately, no photos exist of me wearing one of Malcolm’s orange boiler suits!! Keep an eye on Lidl – Malcolm has excellent dungarees which he bought there very cheaply. Looking forward to photos!! I don’t know anyone who wears “boilers” here in the states, but I LIVED in my Osh Kosh B’Gosh denim overalls in the 90s. I sooooooooooooo loved them. Winston Chuchill often wore this type of garment, which his children referred to as his “rompers.” I have seen photos of him in a special pinstripe version that he wore for dignified events, and I read somewhere that he also had velvet versions. What a guy! So fun to read all these comments! Yes, in the U.S. it is often overalls. I had a pair of railroad striped “Pointer” brand ones that I wore to a shred. I cropped and tapered the legs a bit with a pleat. I am with all the folks who are anti-onesie because of having to strip down to use the bathroom. To my shame, I begged my mother to make me a jumpsuit/onesie in the eighties out of a stretchy terry cloth velour fabric in a deep shade of purple. Like so many others who have written in, I was inspired by the fashions of the early eighties and the cutting edge style of “Eat to the Beat” era Debbie Harry. I would put tissue in the toes of my mom’s skyscraper-high oxblood colored pumps and strut. I personally don’t have a boiler suit, onesie, or any other such garment. I used to love overalls, but now I feel a bit “mannish” in them. The real reason I’m commenting is to say how nice it is to see your face. You are a lovely lady, and just about every picture of you posted here is of you looking away from the camera. It’s nice to see your eyes. Gals on the WWII assembly line – Rosie the Riveters – wore these. Great association, me thinks! Kate looks adorable in her boiler suit! BTW the only thing I’ve found that permanently marked my oaknwork top are dish washing and laundry detergents. Don’t leave the bottles standing out. You can guarantee there will have been a dribble down the side. My relationship with boiler suits consists of washing them when Bob is On Shore. They are bright orange with reflective strips. His North Sea boiler suits are so thick I can only fit one set in the machine at a time. I like seeing them all in a row on the clothes line, as it heralds his home coming after weeks or months Off Shore. Like raising the flag to show he’s in residence. I had two 1980’s fashion jumpsuits made of cotton when I was in primary school (fortunately for me I was in primary school during the 1980’s), one was peach and one was mint green. I LOVED them, I felt like I was a civilian scientist in Star Trek, or Dale Arden in Flash Gordon. I also owned pastel-striped dungarees when I was 12, which are called overalls in the US. I was accused of looking like a clown in them, but I did not care because they were comfy and cheerful. When puberty gave me an exaggerated hourglass/pear figure I found jumpsuits and dungarees much harder to fit. Now there are 3 or 4 sets of U.S. Navy coveralls in our household, which appears to be the US name for boiler suits. My husband is former Navy and wears them for dirty jobs like washing and waxing the car. I have worn them to paint walls, and also used the cleanest set as a Rosie the Riveter costume one halloween. Recently I have taken to wearing old pajamas for housepainting type jobs as we live in a hot climate and polycotton coveralls are very unpleasant to wear when it’s a warm day. One day, when we have our own home and I can get my hands on remodeling, I’ll get myself one for sure! Ah, coveralls…. I have an extra-large man’s coveralls for when I used to work at an exploration camp on a drill rig and log rock core in the Northwest Territories of Canada. Drill grease would get smeared on the core boxes and make a mess of me if I had to carry those heavy boxes. I’m not a large person, just very tall, and they were the only ones the camp had on hand that would fit my length. Happily, a drill rig is not a place of fashion, so it didn’t matter how they looked. They are happily resting in the basement until they are needed for a much more civilized endeavor like painting or playing with clay. Maybe 10 years ago I purchased “painter’s coveralls”, because I just needed to keep the paint off me, and wasn’t concerned about year-after-year durability. I’m a woman of medium height, but a man’s short was way too large in the body, and awkward to work in. So now I, like a few others here, have “painting clothes”. I also have an assortment of shorts, ancient jeans, and ratty but comfortable long- and short-sleeved t-shirts that I call “garden clothes”. This collection is as important to me as my going-to-work clothes are! Your boiler suit is terrific! I have a romper I knitted myself out of Louet MerLin and it is my favorite summer outfit–so comfy. Yes, I’ve got one too. Red, quilted inside. Fantastic for working outdoors and in freezing interiors. Meant for off-shore rig work. But needs to be worn with a belt. Your boy’s one looks very stylish on you Kate, but mine is cut for a gorilla – long body – short legs – perfect hiked up blouson style though. Makes me ever so grateful that outdoors clothing is nowadays available cut from women’s blocks. I love wearing my boiler suit, or coveralls, or more often in my house the poopie suit! (I picked it up from my husband, who picked it up from submariners, US Navy variety.) I think I have three pair floating around. I don’t wear them often, but as an engineer who sometimes gets to do actual shipboard work they see some use, along with my steel toes. We wear ‘overalls’ on our dairy farm for most work situations and have overalls for every season: short-sleeved poplin for warm weather (you don’t have to wear much underneath), long-sleeved gabardine for cooler weather, and heavy-insulated with detachable hoods for the coldest days. It was a challenge to find small sizes for the children – but we found that one-piece snow suits worked well for cold weather. I love my boiler suit. I only wear it for really dirty jobs and it is tremendously liberating as I don’t care how much dirt/paint/varnish or whatever gets splashed on me. It is the same with wearing wellies or hiking boots. You just splodge through and bash on. I’m glad I wasn’t drinking anything when I read that – it really hits a nerve, hysterical. I had the perm and the batwing boiler suit in the eighties too, I called it a flying suit?!? I thought it was fab, it had tabs and tapes hanging down all over the place – goodness only knows what I looked like, thankfully there’s no photographic proof. Of course it was nothing like thel onesies being worn now – not lol. Brilliant! Here too there s a hierarchy of boiler suits, complete with indelible paint, tar, oil stains, they were great for mucking out byres though no longer got cattle, little boys ( and girls) loved the red Massey Ferguson versions. Both my dad and my brother were marine engineers, so I grew up with them, and am looking at a once orange one at this moment waiting to be washed. Main hazard, metal bolts, baler twine, screws and nails in the many pockets being put through the washing machine by mistake. I have the law enforcement version of the boiler suit for my work as a fisheries officer, complete with badges, zippered pockets for notebook and warrant, and a utility belt for handcuffs, lobster measurers and whatnot. With the stab vest, radio, big boots and other impedimenta, I always think that it makes me look like swat team teletubby. Your post reminded me of the time I begged to, and was finally allowed to decorate one of the workrooms in the garden (it was an old photography darkroom I understand) of our property, and live in it! I sewed myself a boiler suit, especially to paint in, and loved it! Very comfortable, and no need to worry about spoiling one’s clothes. Totally agree on how practical they are! Your decorating sounds enviously fun. You look so happy and well. Glad to see you are enjoying your new home. There is plenty of painting to do here so I think I shall treat myself to a boiler suit. Unfortunately I have previously worn one as a fashion garment with a scary perm just to look extra special. Thankfully there is no photographic evidence that I know of! My teenage boys have those awful onesies (a bat and a penguin for some unknown reason) and laze around the house in them annoying me. Hopefully fashion will move on and they’ll be sent to the op (charity) shop soon. What a funny post………not you Kate but all the comments!!! Never saw a onsie here, N. ID but plenty of overalls on men only……in garages and the like. Anxiously awaiting pictures of your lovely new kitchen and THE studio!!! Cheers! We make a distinction in my part of the states, there are jumpsuits, semi fashionable one piece garments popular in the late 70s/mid 80s. I remember wearing short ones in high school as they let me get around the no shorts rule in 80+deg. heat. There are overalls, bibbed with straps over the shoulders, generally considered farm wear although very popular for small children too. In all honesty, not that many farmers that I know actually wear them anymore. I used to wear them when I helped bale hay as they protected my front from being poked buy the itchy hay and straw and let me get away with only a sports bra or singlet underneath. I still own a white pair that I found at Laura Ashley in Oxford in 1987. What you are wearing is what we generally call coveralls, basically because that’s what they do. I have an insulated pair from Carhardt that I wear for long periods of outdoor chores in really cold weather. My dad the retired farmer wears an insulated pair outside from about November to April, on really cold days he throws a blanket lined denim chore coat over it. I usually see mechanics, elevator installers or peopel in other really messy jobs with them. Generally I keep a set of what I call paint clothes, old leggings, and a workshirt for when I decide to tackle something that may destroy clothing. Up north, New York state in the USA, they are sometimes lined with fleece or quilted and called a Carhartt, which is a brand name. I had a disposable coverall once. In south Florida it was unbearably hot and was disposed of nearly immediately. I keep an old pink tank top with built in sports bra and cut off sweat pants for painting and dirty jobs. I’ve been painting all weekend also. Genevieve, reading your comment made me smile—so Southern*! I will NOT be getting me some overalls, though I do have clothes set aside for gardening and messy work. Too much work to go to the bathroom! Plus, I’m nursing a child, so—crazy-impractical. A fun post to read, Kate. I really like how thoughtful you are about what clothing says/means and all that blahblahblah. Have fun fixin’ your place up! (That was Southern-speak, by the way.) *Southern= Southern states of US. I once shocked a classmate at Yale (up in Yankee-land) by saying I was fixin’ to go practice violin. When I was a college student I did a lot,of spelunking in New York and Pennsylvania. We always wore coveralls/ boiler suits in the caves. The spring that I graduated I went on a long camping trip with my mother to the southwestern US. On our way back home we stopped at Mammoth Cave in Kentucky. I learned that you could go on a guided ‘wild cave’ trip and was determined to do so. I hadn’t packed my coveralls some we went off to town and found some. They were so clean and shiny new that I wouldn’t wear them. So my mother dropped them in a puddle in the campground and danced on them. I still have that pair and get them out every fall for yard work. We are in the middle of big renovations in our cottage too: heating, including a new hot water tank and solid fuel boiler, and a new kitchen. I think a boiler suit will be my next buy, for the decorating that must follow. I’ve always wanted one for working in the garden. By the way – have you heard the song Granny Fraser’s Flittin? Frae Aboyne tae Aiberdeen. Good luck with all the decorating, etc. It’ll be great when it’s finished. My father was a pilot and I thought he was so handsome in his “flight suit.” It seems to be identical to what you are calling a boiler suit – except the flight suit probably had more pockets. If I had the ability to upload photos, I could send one. Anyway, they are also used in the operating room here in the USA as a disposable (made in cheap, non environmentally friendly plastic) “bunny suit.” This is essentially the same thing except very cheaply made. It is a coverall with a long zipper in the front. The bunny suit covers street clothes for those who must come into the sterile environment of the operating room and don’t have time to change clothes entirely . This might include repairmen, etc. They are also used for prisoners here in a bright, dayglo orange. Aaaww, you have reminded me of my renovating days. Favourite outfit? My husband’s giant THERMAL bright orange boiler suit. A remnant from his short-lived job offshore. I was pregnant and doing up an old, freeeezing house. The boiler suit kept me cosy, I don’t think. Looked half as stylish as you do but it was great. Recently, I seem to have developed a love of a good pinny….. I am excited to hear about the progress on your new place, and pleased to see that your work clothes are fulfilling their work destiny so beautifully! As several posters have mentioned, the American term for what you are wearing is “coveralls.” I have never had a boiler suit, but am fond of what we call overalls, and have owned several pairs from adolescence onward, though I don’t have any at the moment. The bib-and-adjustable-strap arrangement works better for my long torso. I am also fascinated by the different terms for these and other common items of work clothing, mostly checking British English against American English, following the different words posted here. I have been down the internet rabbit hole looking up definitions and origins of different items of work wear, some of which I had heard of, others I hadn’t. Fun! are you at the lighthouse near Gairloch ? I remember walking there with my late husband BUT the café was not opened on the day we went. Happy memories of a lovely holiday . I went to a private (in Britain, public) girls school in northern Massachusetts in the 60’s. We were required to work 1 1/2 hours per day on assigned tasks such as: cleaning, preparing meats (for the dorm of 50), breads ditto, washing up, setting up and taking down the tables, etc. For this work we were required to wear dummie (short for domestic work) smocks. They were double breasted heavy cotton, and invariably accumulated a large grey stain across the belly from the stainless steel kitchen counters, and the wiping of hands. That stain never came out. In later years, I kept bees for a while, and had a white bee suit, whose use got generalized after the bee passion (and the bees) died. I am not sure I could fit into it now. Our family runs large. I think a boy’s 9-10, might have fit our grandchildren when they were 7-8 or younger. You must run small. Thanks for the memories. I can’t wait to see the inside of your study and kitchen. Actually Sarah private school means private school in the UK too. For no apparent reason, just a few of our very poshest private schools are called public schools so what you would call public schools we call state schools. Here, in Indiana, we call them coveralls, overalls or Carharts (after the company that makes them). I love them for their multi-functioning personality. What I love even more was your comment ‘festering on the couch’…Excellent! I believe if more people were referred to as ‘festering’ in stead of ‘couch potatoes’, they might get up and do something besides festering. Just know that it will be my phrase of choice. And, again, Congratulations on the Vogue Knitting article. I first discovered boiler suits when I decided to learnt to weld and have considered them the most useful item since. I trot them out for working in the garden, decorating, clearing out the U-bends… As this year I am living on wartime clothing rations, I thanked my lucky stars that boiler suits were coupon-free during the war as I needed to replace my battered boiler suit. I didn’t spend a fortune on it, less than twenty quid from Dickies…! Dear Kate, thank you so much for another thought-inspiring comment. The boilersuit topic is one I feel strongly about: I am a farm vet and when in practice I use one daily, same as my farmer clients. Not only my “civilian” clothes would be quite nastily spattered, but also much smellier, if I didn’t wear one between my waterproofs and everyday clothes. Also in these long cold Scottish winters they add an extra layer of warmth which is always welcome when out in the icy rain trying to calve a cow! In short, I love them. I have two blues and a green one, which I tend to use less because of a sizing error bu which I could actually fit twice in it. My husband steals it sometimes to work in the allotment, but only when is clean from the wash (understandably!!). All from Dickies and acquired for the very reasonable price of £18. At the same time I hate, hate, hate all these onesies that you see in the shops that have no actual use except making you look much fatter than your size and like you just skinned a poor leopard (or zebra); or like an oversized slug on a sofa. I honestly cannot for the life of me see what people find in them. I am jealous that you all live in a location where you can wear one. I live in Utah where it as been 90+ for several months. Just hearing about a “boiler suit” makes me cry. However, winter will come and I will be wishing I had one. Here in Alaska the workwear of choice is Carhartts, ubiquitous “boiler suits” in a light orangy-brown flameproofed cotton duck. They’re insulated for working outside in freezing weather. You can see them at carhartt.com. Alaskans love their Carhartts so much, there is an annual contest at the state fair to find the most beat-up, grungiest ones. There are plenty of guys who have a set for “best” as well. As a mother of a new baby, I often wished that the diaper service would be able to deliver to me boiler suits of some soft material that I could wear for the mucky business of caring for my child. I even went so far as to ponder possible zipper arrangements for breastfeeding! I still have my old boiler suit from the 80s when it was a huge fashion statement. At the time I was living in London and dating my now husband in Phoenix, Arizona and the boiler suit was the perfect outfit when I flew over to visit: loose and comfy on long flights with lots of pockets for passport, tissues, money, snacks, Walkman (!) headset etc. Haven’t dragged it out of the back of the closet for years but maybe it will still work for painting. It’s probably large enough to accommodate my expanded girth. I more excited about the dishwasher! I never had one until a few years ago and I LOVE it! I will never complain about having to empty the dishwasher. I never had overalls or its fashionable cousin the “jumpsuit” of the 70s & 80s mainly because of the difficulty in going to the bathroom without completely disrobing. Even one-piece bathing suits were inconvenient. My husband tells a funny story about going out on a date with an old girlfriend who wore one of those jumpsuits like Cat Woman. The date didn’t last long when he asked her if she had been working under her car. Oh yes! Around here we cal them coveralls and they are invaluable. My kids spent their winters hiking and playing outside in their insulated coveralls. So warm and water repellent for sledding, making snow angels, snowball fights and snowfort building. One of the most favorite things I still do with my youngest (now 21) is to lay down under the trees on one of our snow hikes in the woods and gaze up through the snow laden limbs. So warm and snuggly in our coveralls that we could fall asleep. Growing up on a farm, I’ve been wearing boiler suits* since I was big enough to wear the smallest grown-up size (now there are children’s sizes but these were not available at our little local farming co-op in the 1970s/80s). However, these have only been my main farm work suit during very brief periods. In the agricultural school I did as first preparation for agricultural sciences at university, getting one’s own with the school’s name on the back was part of the rite of passage. I used it during my practical training and once into agricultural science faculty occasionally on excursions. I still keep it neatly intact at my parent’s house in the countryside, where I like to wear it while gardening when it’s chilly. It’s dark blue. I also have a run-down one (John Deere green) which I use for painting. My dad who’s been a farmer and agricultural school teacher for most of his life have and still will don a boiler suit most every day, except for the summer when it’s too warm (southern Sweden). He certainly has the full range from run-down to “best” (and also a full range from covered by dirt to decently clean). I do have a few issues with boiler suits, though (cumbersome to take on and off, not suited to the female anatomy**) which have made me gravitate towards the sleeve-less, i e workmen’s dungarees. Since the shoulder straps can be adjusted, they fit better, and if you’re working outdoors you don’t have to take the whole thing off when you go inside to have lunch – they’re even generally OK for summer when a full boiler suit is too much. I quickly grabbed hold of the 2 pairs my grandfather left when we emptied my grandparents’ house. I would not ever ever consider wearing any other version of the boiler suit than the one intended for rough, physical labour. As I wouldn’t ever ever consider wearing fashion imitations of riding boots or jodhpurs or running shoes. If the real thing is part of my wardrobe, an imitation of it won’t be! Love your posts and this one brought back memories of the white coverall I wore to frustrate mosquitos when gardening. My children thought I looked like a spook so the outfit was called my boook suit. LHD in Lerwick is indeed a nice place – I found some rubber gloves thick enough for boiling water (dye pot!). Alas, I came away with three left hand gloves and only one right hand one. And I do believe that Felix has song brewing about said trip to LHD! My semi-equivalent is a pair of railroad-stripe overalls (narrow blue stripes on white) that I snagged out of my sister’s charity-shop donation bags at least a decade ago. They’re worn to an incredible softness and they don’t care at all what I do in them. They kind of like getting new additions of paint colors. LOL…I’m a field geologist in Canada so live in dread of all in one garments. Not at all practical for a variety of reasons (too difficult to adjust for our climate, very long legs / short torso, complete lack of ‘facilities’ would make it a nightmare). I don’t think I could face one even out of the field! Even the drillers usually go with pants and shirts. cette combinaison vous va bien ! I have never heard of a boiler suit! When my eldest was around 8, we bought Mat coveralls, which is what the workers use to wear over their clothes to keep them clean. My husband wears them if he has to roll around under an industrial scale or work in a plant with a lot of mud or flour… Mat wore his constantly for years until he outgrew it. Ah yes….I made a pink boiler suit in the 80s, from a Clothkit kit and enjoyed wearing it. As a beekeeper, I now have a white beesuit /boiler suit. Your post has made me think that such a garment could be my ideal wear for my new role:retired? boilersuits are de rigeur in our house; a necessity in winter. Interesting that you paint the woodwork before the walls. If I did that I’d have fearful splashes from the roller. You must be ultra neat! I cover the woodwork with special tape and also use pads rather than a roller – sharp lines and minimal splashing! Would so much love to have a boiler suit to work or even play in for that matter. Since very warm here I wear what we call overalls, one piece with straps, worn with a short shirt. They are great for slipping on to do most anything. I rather like “the look”, so practical, but am told they are not flattering at all. Know you are excited to get your work done. I am looking forward to seeing it. Loved the post-all in one overalls=fabulous. No matter how many grown up pairs for painting etc they always bring back memories of a younger me “helping” dad fix the car in the 70s. Needless to say ubiquitous wild perm and jade green jumpsuit with zips and d rings were mine by the 80s! I had a white boiler suit in the 1980s complete with D rings and, I think, ties on the wrists and ankles, I’m pretty sure it was because either Bananarama or The Human League girls made them fashionable, it was worn with a big brightly coloured belt, big hair and lots of eye make up. I never really got on with it though, I don’t like having to get totally undressed to go to the loo. Now, I go to a lot of festivals, the animal onesie started appearing about five years ago, then we’d see whole crowds of teenagers and undergrads out drinking in Oxford dressed as cows, tigers, etc. I really can’t see the attraction, they are not flattering on anyone, really (except the under fives). For doing work in as you are in your boiler suit, I like my fishermans smock which I got from a chandlers in Whitby (£10 I think), and my very ancient (still favourite) jeans. MDH has a range of boiler suits, in descending order of ‘respectability’. Gardening, logging, building, working on an engine. I also have a couple, for gardening and decorating. Plus a pair of bib-and-brace for warmer weather. All of them from Mole Valley Farmers. These are nothing like the very short pair ( called Hot Pants), in old gold coloured cord velvet, worn for dancing in the early ’70s. Ahh, memories! Lol. You are obviously getting so much joy from your new home. I wish you so much more. Onesies are okay for lounging round the house – provided you like all of you being naked and freezing every time you need the loo and you have absolutely given up on the idea of being alluring to your spouse!! BUT they should NEVER be seen out of the house!!!! The main difference between a boilersuit and a onesie is that a boiler suit says “stuff’s getting done” and a onesie says “nothing’s getting done”!!! So pleased that you’re getting on so well with the decorating, enjoy your new life!! Yes, yes, yes boiler suits rule!! Since moving to a new house nearly 2 yrs ago I have renewed my love of these garments. Comfortable and versatile for all those jobs where u don’t want to get ur other clothes dirty or paint splattered. And yes I think I too get into a different mindset when I put mine on- I really feel things are going to get done! My new neighbours have got used to seeing my husband and I dressed in our matching blue suits, but did think us a wee bit ‘different’ at the beginning! O, it sounds like your new home is gonna look fantastic ! You had me smile there, with your description of your 80’s boiler suit… I have never owned one myself ( though worn them at work sometimes – I can totally see why you like them ). In the eighties I walked around in a legging, topped with a very oversized knitted pullover, finished off with a thin belt, which is likely far worse than a bat-winged boiler suit.. No photo’s of that either, luckily, haha. I had an “overal” in my twenties, I got it from a place where you could by clothing by the kilo… It was army green, and I felt quite manly in it. I was attracted by the thick indestructible cotton, and thought wearing it would give me a break from attracting boys who were only after one thing. Unfortunately I started attracting women who were only after one thing! In the end I thought it was too much green to wear at once, and cut it in half, so I had a short jacket and baggy pants I wore separately. My boiler suit is an ex/remainder-klm version bought from a local workwear place. Ideal outerwear for removing pebbledash from perfectly good sandstone walls on the back of our new house, and the subsequent lime pointing in nippy northern weather. I do find that when I put it on it puts me in the right mindset for serious work, no faffing about and endless cups of tea, but a couple of hours of hard labour. A very dfferent feeling from that engendered by the mauve bib and brace outfit bought for my first secondary school disco in the 80s, the denim versions of my student years or the psudeo-paper (complete with hoods) ones worn on numerous Greenpeace actions. Don’t have a boiler suit but I do have an all in one ski suit – bright green and pink with a logo on the back. So dated and no longer fits me . Shrunk ? But when I wore it I much preferred it to an anorak and salopettes. I think I just felt more altogether and in one piece. So comfortable to wear except when going to the loo ! I feel at my happiest in my (Dickie’s) painter’s overalls / dungarees. They have a huge pouch for all your painting accoutrements and, because I mainly paint things (furniture) outside, I like that I can tailor what I wear underneath to the weather. Perhaps I should experiment to see if a full boiler suit makes me even happier! I love yours. This is completely brilliant. I too had a boilersuit in the 80s – mine was black with a superlative collection of D-ring loops and ties. Also with batwing sleeves. It was my favourite item of clothing long past the time I should have stopped wearing it (when its legs finished three inches above my actual ankles and the body was so short that to sit down was to risk serious injury). I am VERY happy to know that proper boilersuits for decorating and things can still be bought and will be contacting LHD Marine Supplies shortly! And yes, pyjama-type onesies are still awful and should never be worn in public. Your new home sounds terrific! I used to love winter at Scouting: we would repaint the sailing boats our troop had, wearing boiler suits over our uniform, and clogs on our feet. I have never been inclined, though, to wear a onesie when not being messy in some way! My Dad had two fishermen’s smocks for over 40 years. He picked up in fishing ports whilst working as a marine geologist. Clearing his house recently, the hardest thing was the smock on the workbench ready for the next job; covered in pint and vanish and smelling of sawdust and Dad. I have one! and it is also covered in paint. Such wonderful inventions. Note on the oak surfaces… have them in my kitchen. Thing not to do is leave on holiday with a marrow in a wicker basket and house sitters who just don’t check things (I did not mention kids.. ahum…). Result? Marrow goes off, juice leaks on oak surface, stain ensues and hits so deep sanding not an option… Solution? new surface, or lots of cutting boards. I went for the latter… Otherwise both oak surfaces and boiler suits a joy ! Smiling here: my husband, retired Cornish dairy-farmer, has a very clear pecking order for boiler suits, worse for oily jobs, better, gardening, best (suitable for market!) or other public facing activity. Each autumn their state is reviewed, occasionally something is thrown away but usually a new use/category is developed: torn into strips for soft ties in the garden or rags for the workshop. A similar ritual applies to ‘trousers’, shirts, hats and waterproofs. I have a job on my hands. Always Dickies brand, always from M A Grigg Agricultural Supplies. Clearly old habits (boiler suits) rarely die. Lovely post, Kate, thank you. We call them coveralls here in Canada. Hubby and I bought them with the intent to wear them when gardening in cooler weather (when tree branches were being lopped off…heavier dirtier work being done). Ours were orange….don’t ask me why I picked orange. I think we wore them twice….it was the colour…made us look like a road gang of 2 in high visibility clothing. Should have bought blue :). I’ve loved workwear for many years, wearing the off cast cotton drill shirts of male partners for gardening. In the 1980s I had a bright red bib and braces style overall which I wore for ages until it finally disintegrated in the wash. As I too has a very scary perm I suspect I looked like a circus escapee…..and I was considerably older than 12!!!!!!! Oh yes, we have boiler suits in our household! My husband requested one for his birthday a few years ago, and since then we have always referred to them as ‘birthday suits’. So you will quite often see us around the garden or down at the boat in our birthday suits! I do feel a little ashamed of a brand-new, pristine one – it implies that no work has been done. This is easily remedied by a few spatters of paint or varnish. I had a very fetching pea-green, thick cotton one with a mandarin collar in the 80’s! I loved it, and of course, it finally became my housepainting garment. No pics I am sorry to say! Enjoy your new house Kate, it will lovely I am sure. That’s an interesting question. I actually don’t recall having ever had one of such garments, except perhaps for a short-pant version of it – which was not of the “uniform” type, but more a teen outfit in a pale yellow, good for summer-by-the-seaside times. Sorry for the long comment for nothing – no actual contribution to the question of use of boiler suits! I have only ever possessed one boiler suit, which I never wore. I was frightened of looking like a blue sausage. So I painted in old clothes, getting covered from head to toe. And sometimes, when the mood for painting took me and I couldn’t be bothered to change, in less “old” clothes, which instantly became painting clothes for obvious reasons. I am not getting too old to want to paint much, although the house needs it. Congratulations, Kate, on your energy and enthusiasm. A dishwasher! Ha, that will change your life, much more time for knitting. I’m also a HUGE fan of workmen’s boilersuits (I have 3…..)! Onesies are an extreme risk here in South Africa where we have no rain in the winter months so the air becomes very dry leading to a massive amount of static….static + acrylic onesie could result in human combustion I would imagine! 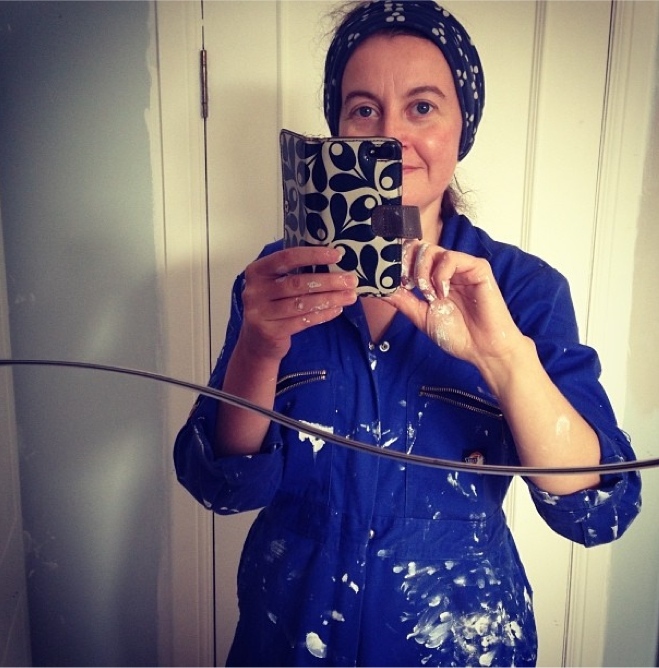 I always wear a boiler suit when decorating or gardening….in my humble opinion every self-respecting girl should have one!! !